Hot Lotto is one of the United States multi state lotteries that is a competitor amongst Mega Millions and the Powerball game. However this multi state lottery is not available in all of the 50 states and the territories of the United States of America. Currently there are only 16 states including the District of Columbia who participate in Hot Lotto. Hot Lotto is administered by the Iowa-based Multi-State Lottery Association (MUSL), which is best known for the Powerball game. As of May 12, 2013, when Tennessee joined the game, Hot Lotto is available in 16 jurisdictions, including the District of Columbia; by definition, all 16 offer Powerball. Because of the 2009 Mega Millions/Powerball cross-selling agreement, the 16 lotteries also offer Mega Millions, with each Hot Lotto member adding Mega Millions on or after the January 31, 2010 cross-sell expansion. Prior to Tennessee, the Maine Lottery was the most recent to join Hot Lotto, in October 2009. Hot Lotto began sales on April 7, 2002 (the game was introduced to celebrate the 10th anniversary of Powerball the same month); the first Hot Lotto drawing was three days later. Hot Lotto gives smaller lotteries the opportunity to create the “middle-sized” jackpots that are commonplace in single-jurisdiction games which serve a sizable population base, such as Florida Lotto and Lotto Texas. Hot Lotto drawings have been recorded and shown online since early 2006; prior to that, Hot Lotto’s drawings had been televised. While Powerball drawings moved to Florida in 2009 with the Florida Lottery joining that game, the Hot Lotto drawings (and MUSL headquarters) remained in Iowa. The Sizzler option, which triples non-jackpot prizes, was added in 2008. The basic game, $1 per play, was unchanged until May 12, 2013, when the advertised jackpot changed from the gross annuity value to cash, and “taxes-paid”; the annuity option was eliminated, as winners almost always chose cash versus the annuity payments. The final advertised gross (and annuity) jackpot amount for a Hot Lotto drawing, held on May 11, 2013, was $6,110,000 with a $4,720,000 cash option. The initial jackpot under the updated format, for the May 15 drawing, is $6,160,000 which is the minimum $50,000 increase when not won, although the advertised amount now reflects the net cash value (after withholdings) instead of the before-withholdings annuity amount. Further increases will be $50,000 per drawing until won, or until the actual “taxes-paid” cash jackpot pool catches up with the advertised amount; the latter scenario would allow larger jackpot increases. †Effective May 12, 2013. Overall odds of winning through May 11, 2013 were 1:16; current overall odds are be 1:17. The Hot Ball cannot “cross over” to be used to match any of the five regular numbers, or vice versa. Prizes are determined by a modified parimutuel system; except under special circumstances, only the jackpot pool (among the prize categories) is shared among multiple winners. 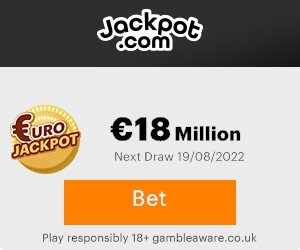 A jackpot won on or before May 11, 2013 entitles the winner(s) to the option of receiving the annuity prize (mentioned above), or the present-day cash value (see below.) Both amounts reflect the gross amount in the jackpot pool, before withholding(s.) The cash value was the then-current value of the annuity, which fluctuated depending on prevailing interest rates. The annuity option was eliminated for jackpots won on or after May 15, 2013. Depending on where a Hot Lotto ticket is purchased, winners (jackpot or otherwise) have from 90 days to 1 year in which to claim their prize. The Megabucks game, the nation’s first multi-jurisdictional game, offered in Maine, New Hampshire, and Vermont since 1985, is expected to end in spring 2013, as the three lotteries are shifting their focus to Hot Lotto as their “mid-tier” game. The minimum age to purchase a Hot Lotto ticket is 18, except in Iowa, where it is 21. Subscription play for Hot Lotto is available in North Dakota, New Hampshire, Vermont, and Minnesota; however, all jurisdictions that offer Hot Lotto allow advance play; the number of draws varies by member. Subscription play is restricted to adults who reside within one of the above four jurisdictions, with the exception of New Hampshire; players may buy subscriptions via the New Hampshire Lottery, even if their residence is elsewhere. Since Hot Lotto is a multi-jurisdictional game, a jackpot winner does not necessarily collect their prize in lump sum. This is because each of the game’s members hold on to the accumulating jackpot money until after the jackpot is won. A winner, initially, receives a payment representing the cash in the jackpot pool accumulated from the winning Hot Lotto member; then a second payment for the remainder of the cash value, for the funds accumulated from the jackpot pool from each of the other lotteries. The District of Columbia, then Idaho, added the Sizzler option after it became available in January 2008. Congrats to Steve Colson from Caldwell, ID who won $3.43 million with Hot Lotto Sizzler. Ticket purchased at Jacksons Store in Nampa, ID.